Since beginning our zero waste challenge, we’ve been left with a bag of plastic each week to put out for the landfill. Everything else can be recycled or reused. I realised that around a third of that landfill waste over the past couple of weeks has been yogurt pots! We get through one large pot (500ml) of yogurt a DAY at Chez Green. It’s interesting that, despite feeling such lightweight plastic, they weigh so much as a percentage of our rubbish. I contacted the manufacturer of the particular brand we use and found out that, alas, the pots are made from polypropylene (code number 5) which is non recycleable. The pots come wrapped in a cardboard sleeve, which I have been taking off and recycling, but we’ve still been left with about 7 (or more on a hungry week) of these pots a week. There are only so many empty pots you can keep for seed pots, craft storage, dens for animals, making telephones and construction materials, although Little Miss Green would (and does) argue. And to be honest, it was beginning to weigh heavy on my conscience anyway, as reusing these things is only slowing down the inevitable – the pots will, at some point, end up in the landfill for the next few hundred years. Long after I, and my collosall yogurt eating habits have departed from this world. I had a dim memory of making my own yogurt a few years ago. It worked well, but Grandma Green bought me a machine that, basically, needed using every day. It had 6 small pots in it and to put it mildly, was a bit of a faff. Everything had to be sterilised, the milk had to be bought to a specific temperature or it wouldn’t work and, in those days, it worked out more expensive to make it than to buy it. Most of the time I ended up with runny gone off milk that was fed to the cat and lots of washing up. The cats got fatter and happier and I got thinner and more sad……..
With the rising price of food, the idea that yogurt costs just as much to make yourself is no longer true. Back then I didn’t even think about what I threw away, so the ‘cost’ to the environment didn’t enter my head. With our zero waste week coming up at the beginning of September I figured I needed to do something pretty darn quick to find an alternative to all this yogurt packaging as I have no intention of giving yogurt up. Either that or I’d have to clean and stack up the yogurt pots and hide them at the bottom of the garden until the zero waste week was over or something. Could I really do that to Almost Mrs A, you lovely readers and my own conscience? No, of course not. I’ve signed up to this zero waste challenge with every intention of being honest and committed to it. My commitment is to my dustbin and the landfill as well. For too long I have put them under untold pressure and been responsible for our dustbin’s burgeoning bosom and wobbly tummy. Et voila. Have you guessed what it is yet? 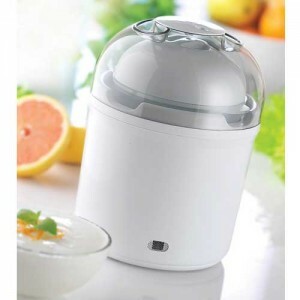 My very own yogurt maker! It makes 1 litre at a time; the equivalent of 2 large pots. Yipee! I couldn’t wait to get started, but it was 4pm when it arrived and you need to leave the yogurt for 8 hours. Even in my excited, happy dance state, I wasn’t about to stay up until midnight to see if my first batch of yogurt was successful. So before watching a film, I boiled up the milk. As I was watching it, I let the milk cool. After the film I stirred the milk into the bowl with a dessertspoon of yogurt, plugged in my lovely sparkly machine and it was ready at 6am. Perfect! My first batch was a resounding success! What other way to get an honest opinion that to try out your culinary experiments on a child? Two pots of yogurt (which is the equivalent of 1ltr) costs me £2.80. Buying milk to make 2 litres of my own yogurt cost me 86p. Even with the electricity to run the machine, I’m quids in and so is the landfill. You don’t have to buy a machine to do this for you; you can make it in a flask. I have every intention of trying this method too, to see which is best. My reservation is that we haven’t really got an airing cupboard (the immersion heater comes on for an hour a day and the cupboard doesn’t really get warm) and the rest of the house is pretty cold, so I wasn’t confident it would work. But then I’m thinking that yogurt making has been around far longer than central heating and electronic gadgets, so it can’t be that difficult. I’m probably just not understanding the chemistry yet. I admit I just panicked at the thought of no yogurt at all and just wanted something that would be successful without too much inconvenience. Yes, I really am a 21st century girl with my need for gadgets and ease of life aren’t I? If you have a flask at home and want to have a go at making yogurt without splashing out on a machine, there is an excellent step by step on how to do this on the fabulous Downsizer site. I made yoghurt in a flask last week, from a two-line description of how a commenter gave me on another blog. The chemistry is not important, what is important is the biology. You are fermenting your milk at blood temperature for eight hours so the bacteria can breed. Essentially, do the exact opposite of everything your good food hygiene tells you to do with milk, and you can’t go wrong: introduce bacteria, keep it warm. I didn’t even sterilise my equipment, as in pasteurised milk the good bacteria you introduce will usually outcompete the bad bacteria already in the milk. I boiled my milk, let it cool to 38 degrees centigrade according to my jam thermometer (the temperature you give a baby bottle), introduced the live yoghurt, gave it a stir and left it overnight. The next morning it still wasn’t ready and had gone quite cold (it’s not a good flask) so I zapped it in the microwave back up to lukewarm, and put it back. In another eight hours I had yoghurt. My flask has a removable inner sleeve, so there wasn’t even much washing up. You make it sound so simple, Ruth! Thank you for your great comment. My challenge at the moment is sourcing organic milk locally, but I’m not about to give up. Thanks again; you’ve certainly made me feel more confident about it all. I figured it couldn’t be exact science because we’ve been making yogurt and fermented products for years. I was quite surprised how easy it was, myself. It’s great when stuff is easier than you thought it would be. One probably should be more careful about sterilising stuff, than I was, though – I have no children to watch out for. I also have no qualms about unpasteurised milk and can’t be bothered with use-by dates. I was delighted you didn’t mention about sterilising – I don’t bother either and I was doubly pleased (if not a little surprised) when the instructions with the yogurt maker didn’t mention it either. I had to sterilise everything with my first one and I just didn’t bother faffing about with it all. I wish you every success with your yoghurt making. I just pop a pint of milk in the micro, boil until it starts rising up the jug. Cool in cold water in the washing up bowl, about 20mins later remove the skin and pour into a bow containing a heaped tablespoon of yoghurt, give it a good stir, pop it in the flask. I then leave it on the side all night, in the morning I have yoghurt! I repeat the same thing most nights, using the yoghurt that was made the previous night! Add dried fruits, flaked almonds, coconut, fresh fruit, honey, whatever you like. It’s lovely! I also use it in making Naan bread and thanks to your recipe Mrs G. I also use it in cakes. Ooooo, I’m procrastinating about the yogurt so much. I don’t know what it is. I’m just in a pattern of convenience and I know it’s nothing but sheer indulgence and laziness. it’s funny how some things are really easy to change, and others, I just don’t want to be prized away from. I really need to look at this and find out why I am making so many excuses! I’ve written to Jess’s to see if there are any other stockists over here 🙂 Thanks for the heads up, they look a great company. I do sterilize my canning jars when I make my yogurt, but it’s not that hard. I just put them in a big pot and boil them for 10 minutes. I’ve not tried it without sterilizing them, but I’m guessing it would be ok, especially since they’re run through the dishwasher(which uses really hot water). I was just reading about the cilantro in your blog. I know it’s no good fresh, but why not chop up what you can’t use and freeze it in ice cube trays, then you can just add a cube to a cooked dish such as curry or pasta sauce at another time? Or you could dry it out and store it for sprinkling over dishes. LOL A quart is four cups…do you guys use cup measurements in Britain? or a quart is 2 pints. I have no idea if that is at all helpful! I could use the frozen cilantro idea in the wintertime…I used cilantro to make some cooked dishes then. Unfortunately, I don’t have a lot of use for frozen cilantro in the summertime. I did make extra cilantro pesto recently and I froze it to use next time. So, yay me…progress! I can use cups or pints – thank you for that. Good idea on freezing the pesto. I understand what you mean about fresh vs dried; some herbs are just not the same are they. I have one of these machines and it’s excellent — barely even registers on the wattmeter. I use it on a time switch, so it runs overnight and stops an hour before I wake up — that way, it cools enough to put the yoghurt in the fridge. BTW, a quart is about a litre; it’s officially defined as two pints, but a US pint is only 454ml, as opposed to an Olde Englishe pint which is 568ml. Any recipe with cups and quarts most probably is American, so just use 250ml. for a “cup” and 1 litre for a “quart”. Welcome to the site – it’s always good to see a new face. It sounds like you have your yogurt making down to a fine art. Thanks for the clear up on the amounts as well; it’s all a bit confusing at times. I use an “Easiyo” system which alkthough officially is supposed to have packets of mix and I do it can be made using some stater, UHT milk and some powdered for added thickness. I’ve also seen over on http://www.moneysavingexpert.com that people are maiing yogurt in their slowcookers. I have a friend who swears by the Easiyo system and like you, she uses a regular starter or some old yogurt. Making yogurt in a slow cooker is innovative. Mine gets ever so hot though; too hot I would have thought. I’ll look into it as another idea! Ruth mentioned above letting her milk cool to 38 degrees, that is far too cool for yogurt making. After boiling the milk I let mine cool to between 49 degrees C and 43 degrees C then mix in two teaspoons of live yogurt and put it in an ordinary vacuum flask overnight. The next morning I have wonderfully set yogurt. If I want to make greek yogurt I strain the yogurt in muslin until it is the consistency I require. Hi Trisha, welcome to the site and thank you for leaving your comment. I don’t remember what I cooled my milk to, I thought it was 38, but I’m not sure what the yogurt maker keeps the temperature at. It’s very interesting to hear of everyone’s experiences so that we can all share in each others wisdom and enjoy perfect yogurt. Greek yogurt sounds scrummy and I guess it wouldn’t separate when cooked? It sounds like you have yogurt making down to a tee. My Dad does not really believe in Zero Waste (‘with all the waste they’ve thrown away at the factory’..) BUT he believes in ECONOMICS & saving money.. so he calculated the cost of bought & made yogurt, & he was onboard! What I did: basically followed the Downsizer recipe, but we’ve always made ‘sour milk’ from raw milk & so I thought ‘why boil’ & just heated the milk & had Dad uhm, finger-test it (he’s an expert) Surprisingly, the thermometer showed this falls in the recommended range: 46°C! Now if only I learn to make butter & cheese too.. 🙂 & find if the milk we get is okay & dioxin-free.. hmm..? I think your sister might come around, perhaps. But even if she doesn’t you’ve done a lot to reduce your waste. Thank you so much for pointing out a link to Poppy’s blog!! I took a look at the video & then some other videos – really inspiring!! I’ll probably just use the food processor, some tutorials on Youtube for that too! am already plotting an evil plot to make Uncle homemade pasta so he doesn’t have to buy storebought (with waste) so maybe I could turn him to zero waste too.. (he has a farm) hmm..? It sounds like you have lots of plans, Layla – I’m looking forward to hearing about all your culinary experiments. Thank you for the link, Trisha; it’s a wonderful page. Let us know if you have a go and how things turn out for you. Hi all, reading your comments is great. My question which yogurt to choose as a starter? Activia types or Chobanis or am I way off the road here?